Breaker bar & impact sockets? Would I be correct in saying the easiest way to remove wheel nuts (and other Defender nuts) in the bush away from power tools would be with a Breaker bar and impact sockets? If so can anybody suggest what brand, model or set would be good for a 1990-2006 Defenders please? You can get 12V impacts that plug into your vehicle/clip to battery. That said, any 2ft breaker bar with a standard 27mm socket will be MORE than fine. Factory spec for coiler Rover type axles is 100nm or ~75lbft. Anyone who wrenches on them or stamps on the wheel brace is going to put the nut through the wheel eventually. I think for life on the road I'd just go with a breaker bar and sockets. Decent impact guns are heavy and can go wrong. Decent breaker bar and socket(s) is pretty foolproof. +1 for the Halfords advanced , had a ratchet knacker up and I’d had it about 4/5 years and they exchanged it even without the receipt but that’s the only thing that’s broken and I’ve got all Halfords tools . Also if you go online you can apply for a trade card , I’ve got one and I told the i was a fabricator welder showed them my wage slip and I’m now the owner of a trade card. If I was going to be in the middle of nowhere a lot I would spend abit more and buy a snap on breaker bar. I bought a 3’ Long one for £110 plus vat just before Christmas. Halfords is fine if you can walk there to replace it but if your miles from nowhere and up **** creek for the sake of £80? I’d be pretty Mildly miffed off with myself. I use Draper expert sockets professionaly and haven’t had one break yet I don’t think. Before anyone accuses me of being a snob i have five or six Halfords/Draper bars in vehicles for changing wheels but I have broken too many when doing more strenuous work. Thanks all. More worried about my wrists actually, used the extendable wheel brace (similar pictured below) for years, no problems. Tried to remove the rear wheel about 4 months ago, one nut was really stuck, overnight WD40 etc, was very patient, no standing on it etc, but when it gave way it took my left wrist with it, still having physio months later and the other wrist isn't great. A. Whats sizes are useful other than 27 for the wheels? You can't rely on a cheap(ish) impact driver to undo wheelnuts. If one is stuck (for whatever reason), you'll be stuck as well. They can be a big help around the garage and speed up work/ decrease load, but you always need a back-up for when (not if) they can't cope. So a breaker bar or a HD wheelbrace or even the standard one is a better idea, especially if you add a length of pipe. This will greatly reduce the strain on your wrists. If it's only for emergency use, it doesn't matter if it takes a few minutes longer. I've found the handle for the LR bottle jack excellent in combination with the standard wheel brace. And if all else fails, you can put the (bottle) jack under the wheelbrace and use the weight of the car to undo the nut. A modest priced breaker bar is what you need. I've had a Halfords one, and a Britool one for years. Both were birthday or Christmas gifts. Guess which one I managed to break 😮.Btw, the Britool bar fits the Halfords replacement knuckles. I find if you break stuff it's usually because you're using it beyond its intended application. good long breaker bar and maybe a length of pipe too stowed safely in car. if especially fussy take two sockets that fit, and a spare knuckle joint and tool to change it - best cure ever cause if you have spares will never break original! As above. Forget the power tools and rely on basic physics. I wouldn't get a bettery impact gun just for taking the odd wheel off. If your changing your wheels every time you go offroading then ok but if it's just for punctures it's too big, heavy, expensive and will probably let you down. I have neilson which was relatively cheap several years ago, it's ok if the ni-cad batteries are freshly charged but soon loses its ooomph from storage or use. I had an onboard air system on the range rover which was an ac compressor feeding a 24 litre tank and it kept up with air tools with a stick wedged on the throttle. The downside was you had to have the engine running and it took up a fair bit of space. I had one of those extendable bars for the motor movers on my caravan which have fairly strong springs and it lasted fine even when it was left on wet grass for some time. I think for a compact tool to occasionally remove a wheel it would be fine. Otherwise tool makes I like are halfords professional and gedore, I have bought some snap on in the past but to be honest I find it hard to justify the price. 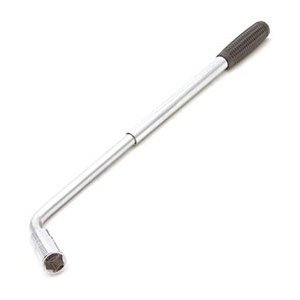 I have a wrench similar to this https://www.landrovertreasureshop.com/product/genuine-land-rover-27mm-wrench-key-wheel-nut-part-lr011870/ a length of pipe can be slide over the handle for more turning ability & a 27mm 1/2inch sq drive impact socket to use with a snap one 2 foot breaker bar. i also have 2 snapon battery guns 1/2-3/8 very good bits off kit but expensive and still have to use the bar sometimes to crack the nut off ! Also, if you use Rocol J166 Anti Sieze compound ( better type of Copaslip) on the threads and seats, they will never give trouble anyway. Breaker bar vote. Got a Sealey Premier one that I have had for twenty years plus and also a proper Britool one that belonged to my Dad and must be fifty years old. Never broken either one. As has been said, required torque loading is not that high.